Ok. No suspense. I traded the V7 Classic for another bike. Last July I took her in for a 24,000 mile service to the local Dealer — TT Motorcycles — and told them to add change the tires and fix anything that they might find. TTM is a small, family-run operation. You wait for them to get to you, as everyone gets individual service and there are only so many bodies in the store. Could it be more efficient? Yes. Would it lose some of its charm in the process? Yes. Be patient. A killer little 2008 Orange Aprilia Shiver with 1800 miles on the clock. I threw a leg over it. hmmm. fits… so nice…. I got off, and asked about the bike. It was a one-owner, with actual miles, bone stock. 19 months left on the factory warranty. I signed the work order and left the store. 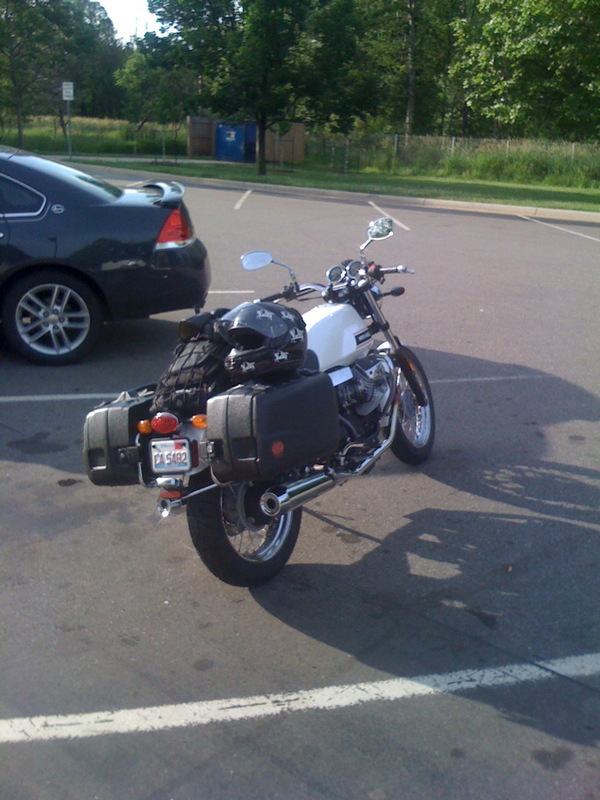 The bike kept talking to me… I no longer had that beastly commute on weekends between Chicago and Detroit as I had now moved to the area. My commute was from Grosse Pointe to Farmington Hills, as I had begun consulting at Mercedes Benz Financial Services; a 70 mile round trip. 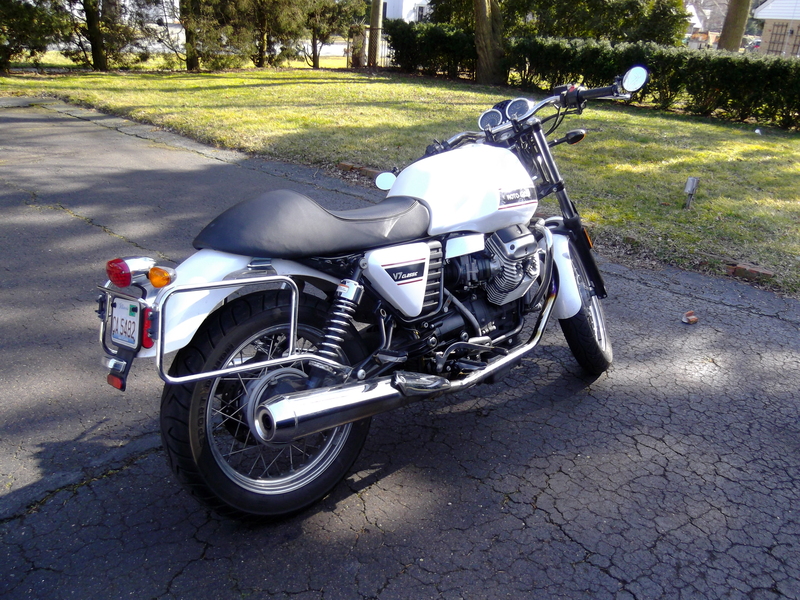 The Guzzi had 24,000 miles and was out of warranty. the Aprilia had 1800… The Aprilia had 77 horsepower…. It just gnawed on me for days. I went back to the shop to see how things were going. It was mid July and the shop was jammed with bikes in for work. I hadn’t ridden in a week except for the Parilla, which was hardly a commuter bike for a 65-mile round trip. I asked, casually, about the Aprilia. He gave me the details. I said that it was interesting, and “I wonder what the out-the-door” difference would be in trade for my bike. He got diverted and we decided to talk later. TT had my bike for 10 days. I pressed. He gave me a number. I shot back, and we got close. I saw a Suomy “Tattoo” Helmet that looked cool. He said he would throw it in. 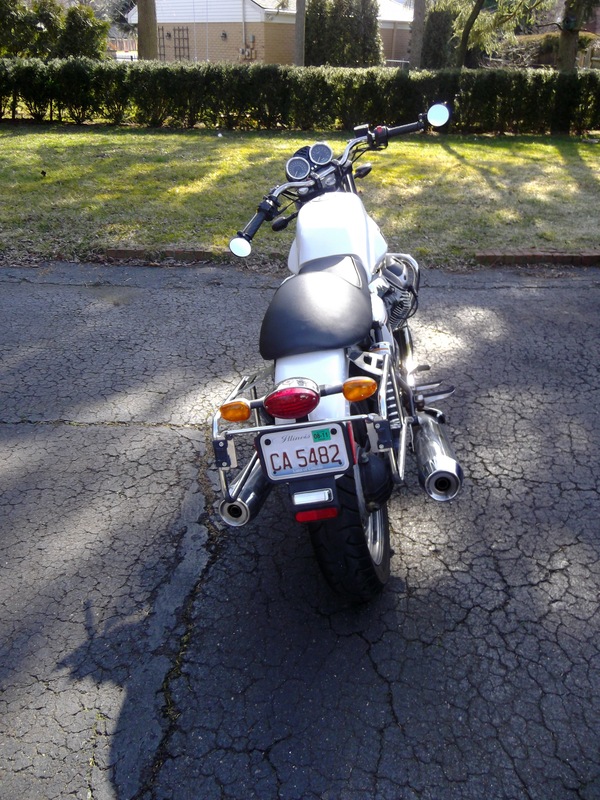 So for very little money, I had a virtually new bike with warranty and a $500 helmet for a 24,000 mile bike. And I’m back on the road. …For three weeks. I had just gotten back from the Mods vs Rockers Show in Cleveland where I had ridden the Parilla (and won Best European bike). The show was held during an unbelievably warm spell there, and I found out that the little Parilla really likes to be run hard; not go with too much stop-and-go traffic (I was riding with the mods). I finally waved them off and met them at the location, with a quick blast around the beltways. This show is on my list. Great town. Really great people. Upon my return, I continued commuting on the Shiver. All of a sudden I get the dreaded “Service” light, familiar to early Aprilia Shiver riders. I checked the Aprilia forums, and it seems that this is a “rite of passage” for ownership of the earlier bikes. Since it was under warranty, I dropped the bike off in hopes that it would be a small fix. It wasn’t a small fix, but it was a “free” fix. The boys at TT Motorcycles actually arranged a conference call with the Factory, TWICE, and they took voltage readings across the throttle settings. Turns out the throttle bodies were bad, and they replaced everything within two weeks. I think the amazing part of this story is how Piaggio has gotten its act together over the last 4-5 years and streamlined the ability to deliver parts to the customers in a reasonable time, and to work with the dealers to ensure that these same customers are happy and riding their bikes, instead of complaining about them over a beer to their friends that will be purchasing a bike sometime in the future. Not much to tell about the rest of the riding season, as it involved a whole lot of commuting, nice morning blasts up the Lodge Freeway, and a couple of short trips around the area. There was a great Britbike show, where my Parilla came in second in European behind a spectacular Ducati 750SS that was very, very, original. Still, I rode (insert sour grapes) the 40 miles to the event. It was a nice long autumn. In early November I decided to get one last commute ride in before it got too cold. The weather man said the high would be about 58°, and I looked at the weather, showing 38° in the morning. I geared up and fired up the bike. Rolling out of the driveway, I took a left onto Meriweather, and then a right-left on Ridge to get down to Mack. That was the plan. On the right-left “chicane” on Ridge, there were a few wet leaves that got under my front wheel, and just as I swapped my weight, I was skidding across the tarmac before I even knew what happened. It was only a 5mph low-side, but it was just plain silly and embarrassing I snapped off the brake lever, scratched the clutch cover, rubbed a tank bumper and plastic panel, and ground a little off the brake lever. $250 in stupid tax. Of course Piaggio had the parts in less than a week, shipped directly to me via my dealer. Sometimes it pays to think a little before firing up. I let my want get the better of my better sense, and paid the price. I guess it was lucky I wasn’t on the freeway. I have a couple of aggregation sites that I watch showing Craigslist listings over most of the US. 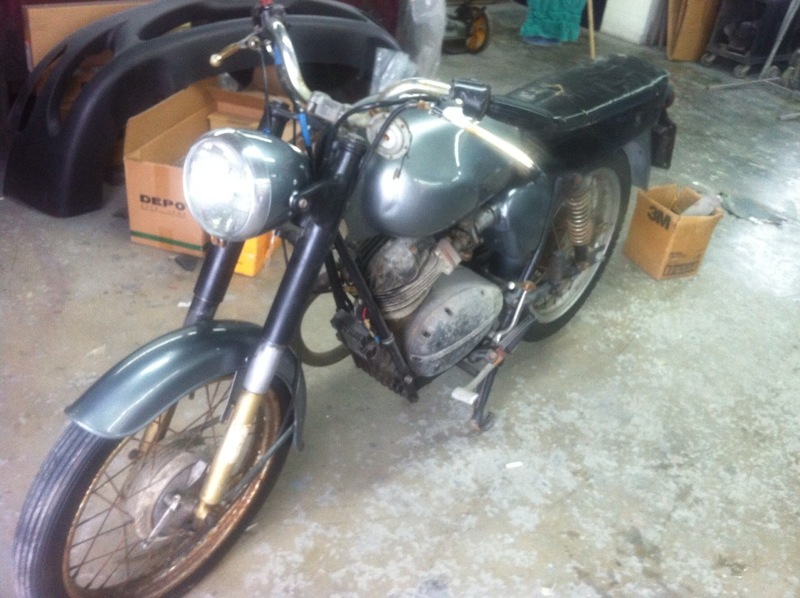 One of these showed a Moto Guzzi Stornello Sport in Indianapolis for $450. I traded some emails with the owner, and just after Christmas I picked it up. I promised Sheila that I would work on it after the kitchen is finished. It is very complete, and after running the serial numbers, I found it to be a 1965 Sport America, surprisingly stock, but in need of cosmetics and some of the chrome bits and stuff cleaned up, along with a complete wiring harness. Nothing scary. It’s all there. 17 inch wheels and all. I can’t wait to fire it up this summer. Trying to decide on a color scheme. 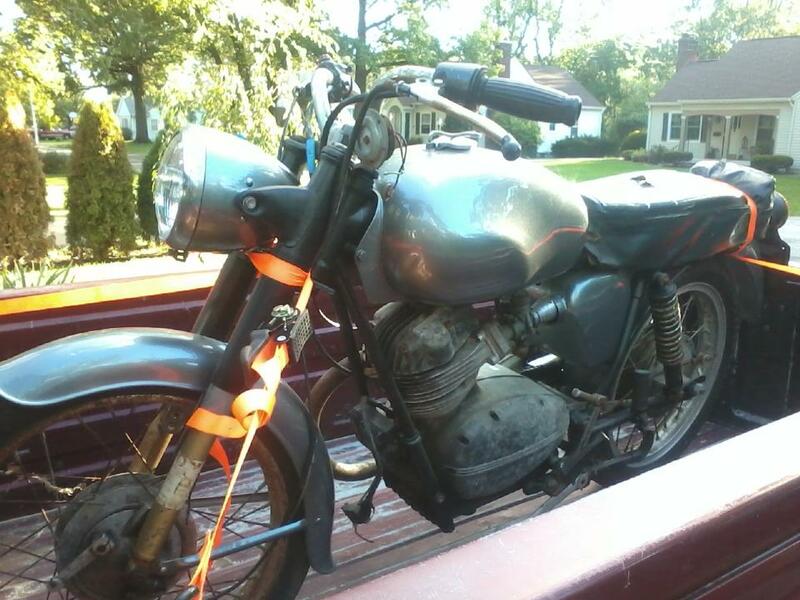 I think I have one in mind, along with a very stylized early 50’s Moto Guzzi logo. Oh boy, it’s going to be a fun 2013. So I have been looking for more aggressive handlebars to put on my V7 Classic. The stock ones were nice but I wanted a better “look” and also a little more weight on the front tires. 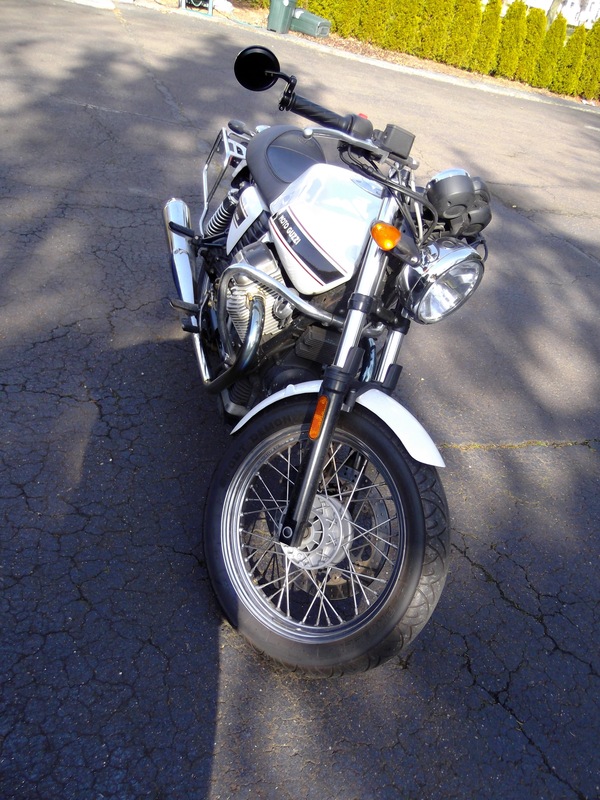 My Parilla 250 has VERY aggressive clip-ons that are fine for such a light bike; for the V7C I thought that something that was a little more upright but lower than stock might be the ticket. I posted on a few forums, and many chimed in and recommended the Laverda “Jota” replica bars available from numerous places on the web. They are fabulous looking setups, but I wanted to see exactly how little I could spend and actually get some really decent bars. The other choices were “swan neck” styles, and I did consider them, and finally dropped them when I’d have to take the triple trees apart to get them on the forks. Well within my mechanical skills. Still, I want to make it cheap and easy. A good friend recommended Norman Hyde “M” bars. I didn’t have pictures, and I’d ridden and written about Triumphs, for which these bars were actually made. 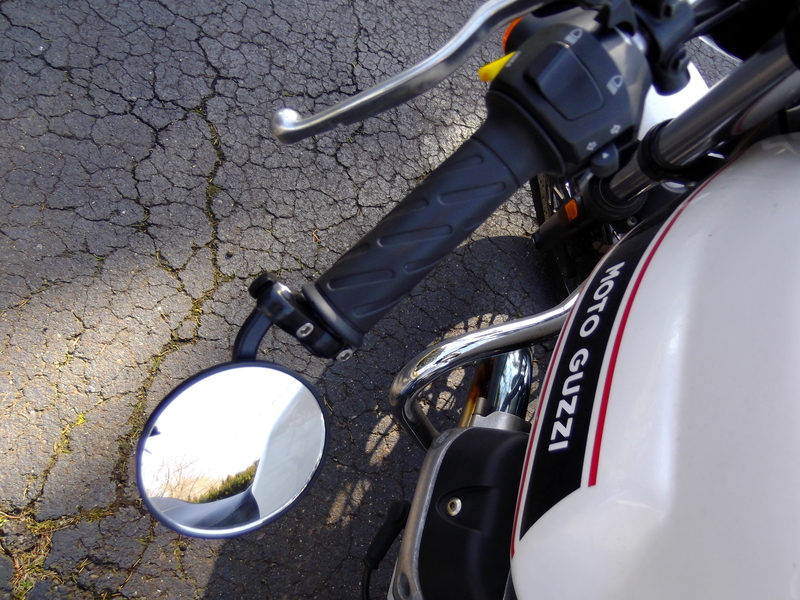 The clearance for the M bars is a substitute for the “Clubman” bars on other cafe bikes. I bought my bars on eBay for about $45 bucks, and a set of cheap, nice bar-end mirrors from Amazon for another $19 plus shipping. Fit and finish were awesome. Installed in about an hour. The cables were a little crowded, but everything ended up fitting nice. I discarded the bar end weights that came with the original bars, and I saved them to install on a friend’s Aermacchi project that I’m completing. 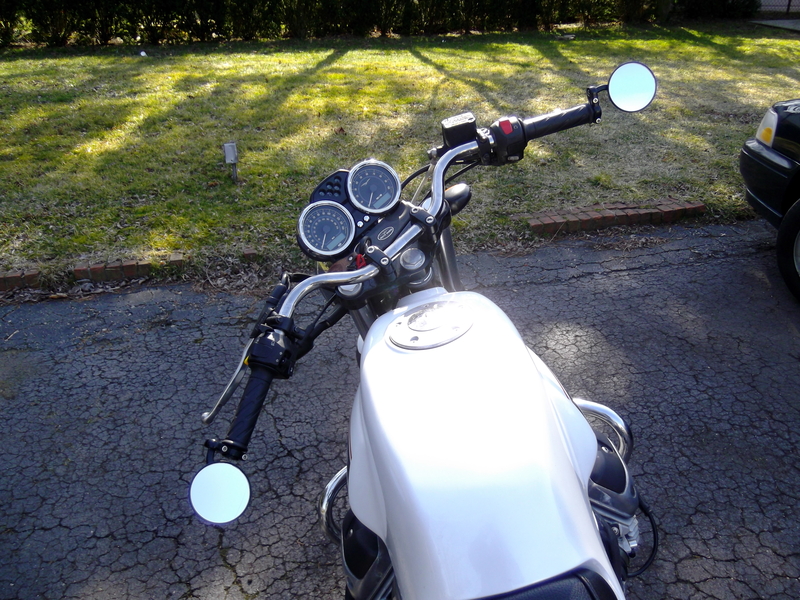 The bar end mirrors installed quickly, and the adjustability and quality were damned nice. Allen bolts in two different sizes do the clamping and holding. I gave it a short ride around the block. Everything was tight, but it’s Detroit, it was February and it was dark and cold. I pulled in knowing that the install was sound and everything worked well when riding around the block. And then it rained and froze for two days. When the weather finally broke, I pulled the bike out of my man cave and threw a leg over. First thing I noticed was the narrower bars caused me to twist the throttle and rev the engine, which is uncomfortable, to say the least. Glad to say that after a few days this has completely disappeared. It’s been a few days’ riding now, and I have over 100 miles with my hands on the new setup. In a word, delightful. Slightly less wind blast than the standard posture, and waaaaayyyy more feel. The front wheels dance under my direction like they have never done before. Fast and slow corners are much more comfortable to set up and navigate through. The new position and the bars’ size and shape compliment this bike so well that the first thing I’d do is ditch the stock ones and put these on. Comfort is another area. I ride big miles on the Guzzi. It’s over 20K miles since I purchased it in August of 2009, with a couple of really miserable Midwest winters to keep me off the road for extended periods. I require bars that are comfortable on my arms and keep my back in a nice straight posture. The Norman Hyde “M” bars are exactly what the doctor ordered. Oh, and bar-end mirrors for me and my new setup? For the first time ever I can actually see exactly what’s behind me. I don’t have to move my shoulders around to see traffic. I don’t have to squint to make out what the size, density and speed of things approaching from the rear are. No vibration, no wiggle, nothing at any speed or RPM range. So I can see everything behind me, ride comfortably with even greater confidence, and rock a nice cafe bike look for about $75. What’s not to like? Where has time gone? I haven’t written anything about my V7 Classic in more than a year. I guess life and the enjoyment of life kinda get in the way, plus just actually getting down to business and writing something out can involve a little mental effort. Funny thing, life may have gotten in the way of writing more articles about this wonderful Moto Guzzi small block, but it definitely wove itself around it! A long weekly commute for 18 months. I took a position as an Enterprise Architect Consultant in Detroit mid 2010, and started an 18 month long period of living in an apartment in Grosse Pointe Park, MI, for 4 nights a week. Weekends were spent at home after making the 300 mile journey back to my home in Oak Park, IL. 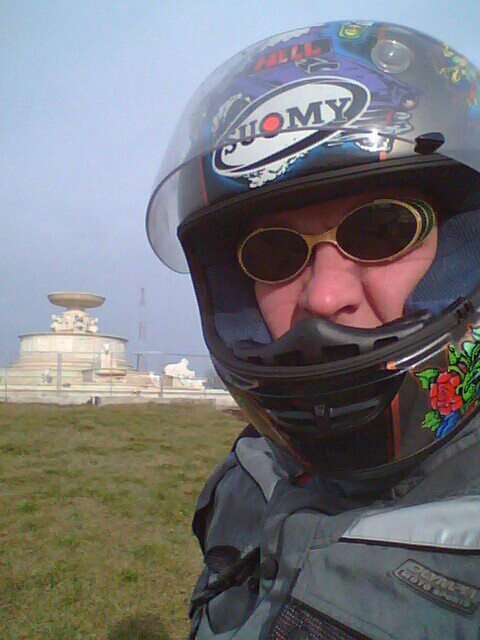 I started work around May 1 2010, and, until the riding season ended in Mid October, I never drove a car in Detroit. Most of the commutes were made on the V7 Classic, so I was making two 300 mile trips a week on the bike, and then 30 miles a day commuting, along with some very fun trips, which I’ll get to in a bit.